Welcome to the annual Brandcameo Product Placement Awards. For the last decade, brandchannel‘s Brandcameo feature has tracked product placement and brand appearances in every film that finished #1 at the US box office. Each year, with input from our readers, we honor the good, the bad, and the ugly (and the most) product placement in the year’s films. Without further ado, here are the 2012 winners, looking at movies released from Jan. 1-Dec. 30 of 2011. The envelope please…. Apple won this category in last year’s Brandcameo Awards, so it comes as no surprise that it has won again this year. Apple products appeared in 17 (or 42.5%) of the 40 films that were number one films at the US box office in 2011, showing up nearly twice as often as the the nearest brand. For Apple, that is a significant increase over the pervious two years—30 percent of #1 films in 2010 and 44 percent in 2009—but still down from its ten year peak of appearing in almost 50% (20 of 41) of number one films in 2009. Apple has already appeared in 50 percent of 2012’s #1 films. Dell, Chevrolet and Ford tied for second place, each appearing in 22.5% of the top films. Cadillac, Coca-Coca and Mercedes-Benz all appeared in 17.5% of the #1 films. Apple-branded products have now appeared in more than one-third of all number one films at the US box office between 2001 through 2011 (129 of the 374 #1 films during that period). That is second only to Ford (153 of 374) and well ahead of third place Coca-Cola (103 of 374). In fact, Apple products appeared in more top films in the last decade than McDonald’s and Pepsi and Sony Vaio combined (122). Those numbers do not even include the preponderance of Apple product placement in films that did not reach #1 at the box office. In 2011 alone, films featuring Apple products that didn’t reach the top box office spot include Bridesmaids, What’s Your Number, Trust, One Day, Friends with Benefits, The Muppets, Abduction, Beginners, I am Number Four, Footloose, Spy Kids: All the Time in the World, The Dilemma, Win Win, The Lincoln Lawyer, The Ides of March, Sanctum, Scream 4, The Girl with the Dragon Tattoo and Young Adult. A scene in We Bought a Zoo could double as an Apple Store tutorial for the iPhoto app. Apple insists that it does not pay for product placement and Apple media relations does not respond to questions on the subject. Just what, if anything, did all of this “free” product placement do for Apple’s 2011 record earnings ($46.3 billion in the last quarter of the year alone)? Front Row Analytics, the analysis division of Front Row Marketing Services, applied its proprietary product placement valuation metric to seven of the top films Apple appeared in last year. In the case of Mission Impossible 4, Apple spent more than five total minutes on the screen for a value of over $23 million. Front Row’s analysis uses dynamic qualitative and quantitative metrics which take into consideration total theatrical distribution, gross box office receipts, product location factoring, integration of product into script/scenes, product affinity, appearance value and additional parameters to isolate the overall impact the product has in the film. The values are for theater runs only, and do not account for more value from DVD, on-demand, download, cable TV and other viewings. Apple’s continued dominance is even more surprising considering how other computer makers have moved in recent years to push it out. Samsung had an official sponsorship deal with Mission Impossible: Ghost Protocol, but that did not stop iPhones and Macs from stealing scenes. Sony Pictures-produced Girl with the Dragon Tattoo managed to slip in a Vaio, but Apple logos still provided a glowing beacon in the grim, dark film. It should surprise nobody who saw it that Transformers: Dark of the Moon tops the category with a couple dozen more brands than its nearest competitor. The film packed in 71 identifiable brands and products, 7 more than last year’s winner, Iron Man 2. As for the franchise, 2011’s entry comes in well above 2009’s Transformers: Revenge of the Fallen (47 identifiable brands and products) and just short of 2007’s first film which packed in 78 identifiable brands and products. It would take a heroic effort to outdo last year’s match-cut from an IWC watch face to a birthday cake in Wall Street: Money Never Sleeps. That hero was Green Lantern. In a placement that comes after a bit of foreshadowing, our glowing green hero saves the day by using his powers to create the largest Hot Wheels track ever. How much of a commercial was it inside the film? It was used, practically unedited, for a Hot Wheels commercial. Like the original, the film revolves around a hot shot advertising executive which sets the stage, as with the original, heavy inclusion of product. Lipton, Ballantine’s, Armani, Puma and Acura all feature prominently and the movie kicks off on the set of a Hummer commercial. While the original used the creation of a Nike campaign as plot device, ????? uses Italian sport brand Lotto. But what I Know a Woman’s Heart knows knows more than women’s hearts. It knows Apple product placement. Probably the most astounding Apple product placement achievement of 2011, nearly every third scene in I Know a Woman’s Heart features either a MacBook, iMac, iPhone. Even the sage, elderly Chinese codger from the retirement home, who’s there to add emotional depth, rocks out with an iPod. A few months ago, China become Apple’s second largest market, accounting for close to 15 percent of all sales (up from 2 recent in 2009). In February 2012, Apple CFO Peter Openheimer said these numbers were “just scratching the surface” in the market. As it opens more Apple Stores in China, is it any surprise the brand is pursing the same product placement strategy there too? Auto brands had impressive roles in a number of top 2011 films. Mercedes in Transformers: Dark of the Moon. Acura in Thor. Harley-Davidson in Captain America. Volvo in Twilight: Breaking Dawn. And BMW in Mission Impossible‘s fourth outing. But no brand played a bigger role than did TGI Fridays in Zookeeper. “Is TGI Friday’s as incredible as it looks?” asks a talking Ape. “It’s pretty good,” says Kevin James as the talking zookeeper before he forms a deep bond with the ape when he springs him from his solitary cage for a night of food, friends and fun! Product placement is pointless if it doesn’t product impact. Last year saw a number of successful product placements that rocked the ROI. In the month following Mercedes’ role in Transformers: Dark of the Moon, sales of star model SLS AMG were up 14 percent. By the end of 2011, sales of the Dodge Charger, the unquestionable star of May’s Fast Five, were up 227 percent. 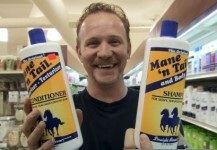 But the walk-away winner of exposure and return was Mane ‘n Tail, the shampoo for both steeds and Steve, that got the spoof ad treatment in Morgan Spurlock’s product placement-funded documentary POM Wonderful Presents: The Greatest Movie Ever Sold. Mane ‘n Tale has done product placement before (Will Ferrell’s Blades of Glory, anyone? ), but never with such results. It took just 30 years for USA Today to become an iconic American brand, thanks in part to product placement. From its founding in 1982, the visually-driven newspaper has embraced product placement. By 1983, USA Today starred in its first film, Burt Reynolds rom-com The Man Who Loved Women. In 2011, USA Today appeared in four of the year’s top films: Contagion, No Strings Attached, Thor, and Transformers: Dark of the Moon. By the time of its starring turn as the paper of the future in 1989’s Back to the Future 2, USA Today was already a mainstay of the silver screen. USA Today was so well known to audiences by 1990 that producers of Total Recall thought a “Mars Today” joke was prudent. The joke became a common one. The 2004 “what-if” film C.S.A. : The Confederate States of America features CSA Today. In 2002, USA Today was predicting the future of networked e-readers in Minority Report. Louis Vuitton appeared in a four of the top films last year including, Transformers: Dark of the Moon, Limitless, Just Go With It and The Hangover 2. Except that Louis Vuitton insists it starred in only three. When Zach Galifianakis’s Hangover 2 character quips, “Careful! That is a Louis Vuitton,” he was speaking about LV knock-offs. Vuitton is so serious about its stunt double that it sued Warner Bros., alleging brand damage after the line “became a catchphrase.” Louis Vuitton accused the film’s producers of using a knock-off made by Diophy, which Vuitton is also suing. Mentioning “product placement” and E.T. the Extra-Terrestrial, often prefaced by terms like “since” or “beginning with” in reference to Reese’s Pieces, is a prerequisite for press coverage of product-placement. This award goes to the placement receiving the most overall media attention in 2010. With about 1,810,000 search results for “product placement” + Transformers: Dark of the Moon,” Michael Bay’s Fourth of July blockbuster walks away with this award with nearly a million more results than last year’s winner, Iron Man 2. This year, extra credit goes to Sony Pictures for acquiring the domain Frienderz.com and redirecting it to, of course, Sony’s movie website. It’s worth noting that Sony’s studio arm was also responsible for airing Facebook’s dirty laundry in The Social Network. The 1985 film The Coca-Cola Kid celebrated one man’s struggle with a Coca-Cola franchise. This award celebrates achievement not only in a branded film title, but also in fully incorporating the title brand product in the plot. The Lincoln Lawyer featured Matthew McConnaughey being a lawyer in the back of his 1986 Lincoln Town Car. Former winners include Harold & Kumar Go to White Castle, The Devil Wears Prada, Because of Winn-Dixie, and I Love You Phillip Morris. Before its time, the film Wayne’s World openly skewered product placement. This award recognizes achievements in winking at the entire embedded ad enterprise. While the entire film Pom Wonderful Presents: The Greatest Film Ever Sold, Johnny English Reborn‘s “Toshiba British Intelligence” and extra terrestrial film Paul‘s ode to E.T.’s legendary Reese’s Pieces were all stellar examples of the form, this year’s award goes to one far more deserving. Our personal favorite fictional product from a 2011 prop that became a real thing is the film Paul‘s “Evolve This!” t-shirt of Jesus shooting Charles Darwin in the face. It was a banner year for unwanted product placement that ranged for good natured ribbing to downright mean. The Minnesota Department of Health was made out to be a gaggle of unknowledgeable bureaucrats in Contagion, Hangover 2‘s version of Bangkok moved Robert Ebert to wonder if the film was “an anti-travelogue paid for by a rival tourist destination — Singapore, maybe,” while the jokers in Hall Pass took some playful pot shots at the sexiness of Applebee’s.